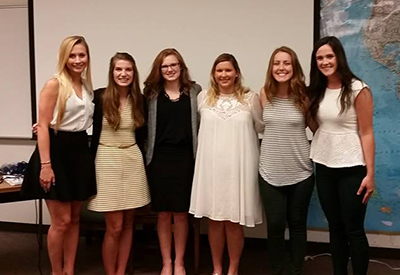 2015-2016 officers: Brianna Bassett, PR director; Lane McCurley, treasurer; Molly Meeker, vice president; Juliana Taylor, president; Andrea Gaul, secretary; and Mary Cate Scroggins, historian. to provide public relations majors and students interested in PR with opportunities that expand their interests. to connect with a dedicated national association. to serve the community through public relations projects. to expand students' understanding of this growing profession. Meetings are held twice a month and membership dues are $75 annually. Dr. Marlene Neill, faculty advisor, is available to answer any questions about the organization. PRSSA strives to advance the profession of public relations through peer and professional networking, local and national programming, advocacy and diversity. One of the biggest advantages to PRSSA is the networking opportunity. By attending local PRSSA meetings, the National Conference, Regional Activities, the National Assembly and Leadership Rally, members can meet peers and professionals from across the country and globe. access to the national internship/entry-level position employment database--JobCenter. the opportunity to apply for more than $20,000 in scholarships and awards. the ability to contribute to the commitment to international public relations by leadership opportunities offered to members on both the local and national levels. For more information, contact Dr. Marlene Neill.